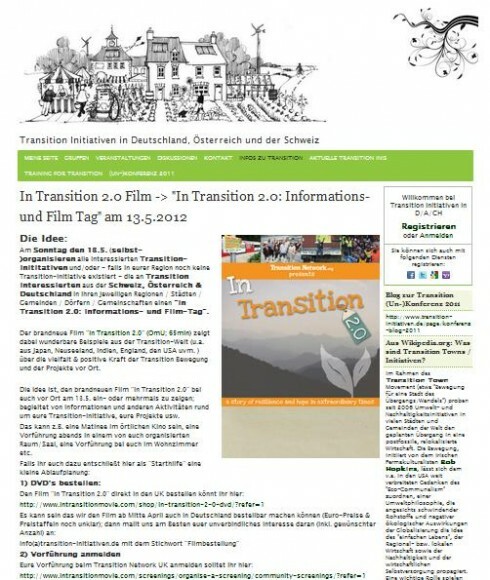 “Sunday May 13th 2012 will be declared “In Transition 2.0 film and information day” in Germany, Austria and Switzerland! We kindly ask all German, Swiss & Austrian Transition initiatives to self-organize screenings of the movie at that date in their regions/towns/cities. More info for the organizers (in German) & about the coordination here. A screening in Bielefeld is already fixed; see details here. We would love to generate a lot of broad, positive reviews and excitement about the movie and Transition in general at that date in the German-speaking region(s) of the world”. From Ireland, Davie Philip from Transition Ireland and Northern Ireland National Hub reports that on March 22nd as part of the Ashoka Change Nation event, a number of Irish Transition catalysts met Rob Hopkins to discuss progressing a number of new Transition projects in Ireland. Also, this Easter, Dermot Higgins and his son Fionn (from Rush, Fingal) will attempt to paddle across Ireland by kayak, from Dublin to Donegal (330km) in just six days. 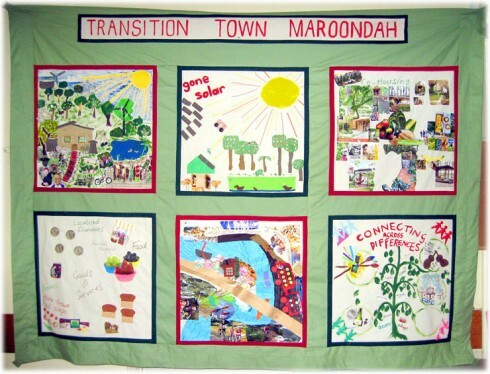 The money they raise from their exciting expedition will go to their local Transition Town – Rush Open Organisation for Transition Status (ROOTS). Read more in The Final Independent. Good Luck Dermot and Fionn! 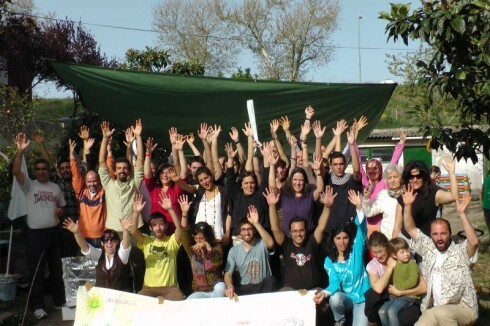 From Portugal, here is a piece from the newsletter sent in by the Transition Portugal (a National Hub), entitled “In Portugal, creativity is used to find alternative ways of financing the 2-day Transition Launch Course”. Celebrating Spring, Transition Portugal stepped a little further towards a more sustainable and inspiring paradigm: during the weekend of 23/24th of March, the Linda-Velha Transition Initiative organized the 3rd Transition Launch Course in Portugal, the first led by Portuguese Trainers. At the same time, the organizing team and trainers presented their ‘dream budget’ on the blackboard, specifying not only the real costs of goods acquired (mainly stationary) but also how much the organization and trainers would like to get for their work. The dream budget was €1290 … and a couple of minutes after… the sum collected was €1211 … Waw!! !… A dream came true… It did work!… Congratulations to everybody! So in this time of change, notably for a country like Portugal, our recent experience demonstrates that blooming and flowering are here to stay. Lets show our dreams and colours! Trust we will be pollinated and tasty fruit will develop… Lets believe that bees will spread our pollen … Let’s create that magnificent Garden we envision to live in! 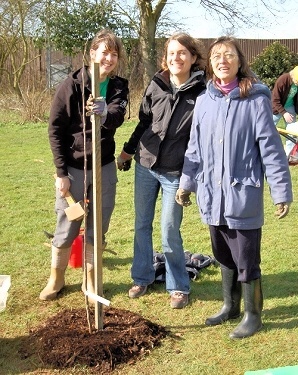 Reading Transition Town volunteers Charlotte Selvey, Sabrina Piergorossi and Ornella Trevisan in Palmer Park. Over to the UK now, and TT-Reading have been busy planning sweet chestnut and walnut trees as part of their edible planting project in the town (see right). In Cheshire, T-Wilmslow who were recently awarded a substantial grant from the Governments Local Energy Assessment Fund (LEAF), held a public meeting inviting local residents to share thoughts about the future resilience of the town. 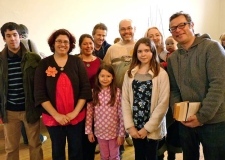 In Derbyshire, T-Belper want to transform a local church car park in to an allotment and have met with a plethora of reactions from the towns councillors! Read more in the Ripley and Heanor News. On the subject of tree planting, TT-Exmouth in Devon planted almost 50 trees opposite local Greenfingers Garden Centre who kindly provided a soup lunch to the many volunteers who turned out to dig. Also in Dorset, TT-Dorchester’s energy group held an information road show on retrofitting and much more. In Hertfordshire, TT-Berkhamsted held an event during Climate Week called ‘What On Earth should we do about Climate Change?‘, and in Kent, Tunbridge Wells just got its first electric vehicle charging point in the town. 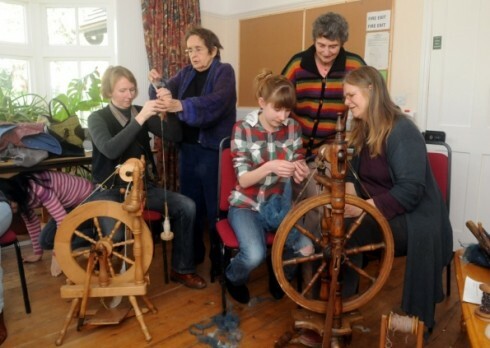 Transition Harborough and the Rural Community Council are hoping to gain a substantial investment from the Big Lottery’s Communities Living Sustainably Fund. 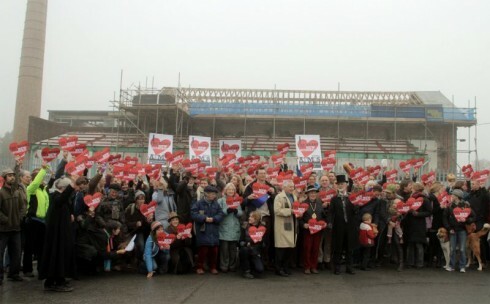 In this Green Building Press article you can read their many proposals for positively transforming the town. There’s more on this story in the local Lutterworth Mail. 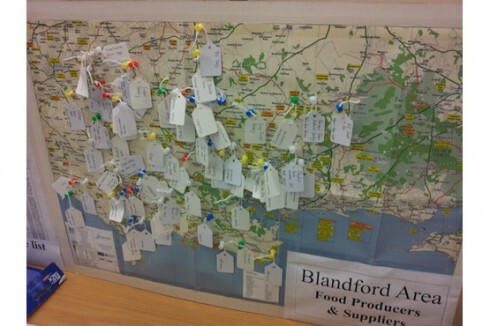 Thanks to Anita van Rossum of T-Chichester, in West Sussex, for sharing this great video of some of their activities. Over now to Canada. 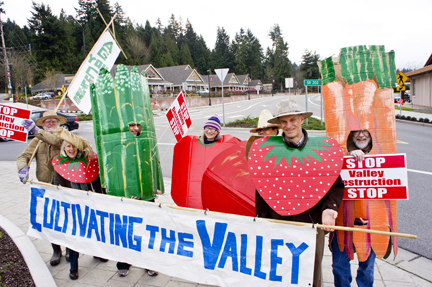 TT Sooke on Vancouver Island, hold a regular Transition Town Café to discuss ideas and engage the local community. 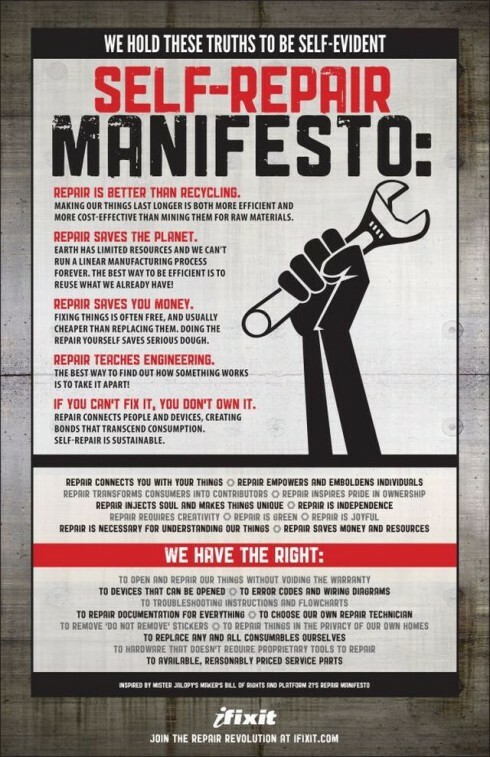 TT-Powell River featured this great Self-Repair Manifesto on their website – a must for any Transition up cyclers and fix-it fanatics (see poster, right)! Also in British Columbia, Nancy Hofer of TT Comox Valley recently presented to the CVEC. The Comox Valley Environmental Council is a 21 year old ‘Not for Profit Society’ which acts as an umbrella organization for 20 local environmental organizations and local Municipal and Regional representatives. Read more about the meeting here in Canada.com. In Ontario, T-Guelph held their second Resilience Festival over two days, read more in the Guelph Mercury. To Brazil. Thanks for Isabela Maria Gomez de Menezes for this wonderful story and picture from T-Brasilândia who celebrated a Beauty Day dedicated to the beauty and strength of the women of Brasilândia. The beauty day, was a day totally dedicated to the beauty and strength of the women’s of Brasilândia. The event honoring the month of women was organized by women of the Transition Brasilândia, in the community of Vila Teresinha in Brasilandia. 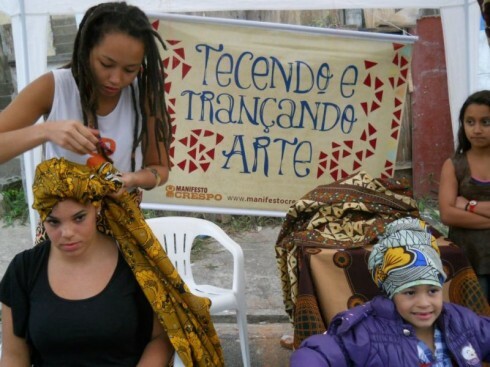 Throughout the day the visitors could enjoy the hairstylist and treatments offered by Institute Embelleze, and also learned how to make turbans and braids with the girls of the collective “Manifesto Crespo”or the Curly manifest, with the project “weaving and braiding art”, which enhances and strengthens the memory and afro brazilian self-esteem. They also had massage available and the women from the “Brasilianas”, selling their products made with recyclable materials. During the event, an street art artist from the community, painted a wall with themes of the event. Closing the day they raffle a free registration in a Gym Club and distributed seasonings seedlings provided by the Office of Sustainability, to promote the habit of cultivating food crops at home. For the Transition US March roundup of what’s happening in Transition in the US, click here. In California, TT- Berkeley celebrated their first birthday with a Potluck meal. The event also doubled up as an informative get together for those wanting to know more about Transition and how to get involved. Frances Bigda-Peyton of Bedford-TT (MA) writes an article following her attendance at a recent comprehensive plan workshop and suggests that resilience is crucial for the towns’ future. Also in MA, T-Ashland have started a new programme called Grounds around Town which is a fantastic and innovative way to make use of the towns used coffee grounds. Jamaica Plain New Economy Transition held an event called Education not Deportation. Canton Public Library in Michigan has been hosting a Transition Towns series and this month was Getting Started in Organic Gardening with Bettylou who says you don’t need lots of space to start growing food. 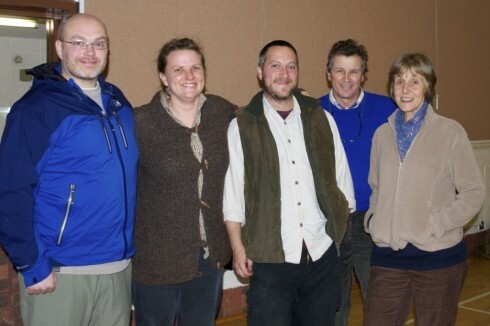 T-Keene (NH) has launched a Neighbourhood Food Security (NFS) program which has a very specific goal – to produce 30% of food locally by the year 2030. 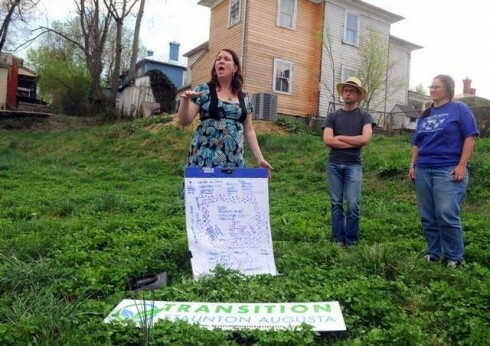 T-Staunton Augusta (VA) are transforming an unkempt lot in to a New Town Community Garden. Co-founder Lindsay Curren (also of Transition Voice) is excited by the amazing response she’s had so far (see right). T-Port Angeles (WA) held their first public meeting and over 100 people turned up! To keep up with developments in Transition between these monthly roundups, keep an eye on Transition Network News, Transition Network Projects and Transition Voice. If you would like to hear more about any of these stories in the next podcast, please let us know. Thanks for including us in your March round up. I am looking forward to sharing our April Earth Day events with our global Transition family. thanks for the roundup! Will use it for my translation of Ben´s Transition Presentation!